Midnight biryani craving is a real thing, and these guys at Rang De Basanti Dhaba are right on our page about this. That is why they have started a midnight biryani buffet spread! Did you just say OMG because we did too! It's not just biryani at midnight, there's also a buffet attached to it. Started a few days back, the buffet at Rang De Basanti Dhaba is set to make our midnight so much more exciting because food coma is so much better than sleep. Duh! Sneak out to meet the buds or a moongazing date with bae - biryani is good reason to get a clean pass at home. Take the long drive or a short walk to this restro, but come with an empty stomach because there's a buffet to make best use of. 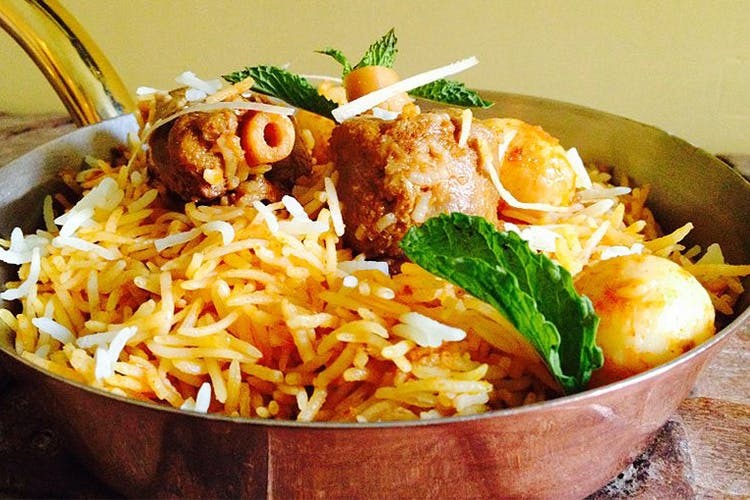 Load up on chicken or veg biryani as much as you want. And on the side try the tandoori roti and creamy dal makhani to go with it. Dhaba food done right without leaving the city or burning the fuel. You won't need firni to make the deal more sweet because all of this comes for just INR 199++ only! The buffet is available between 11 pm and 12:30 am. There isn't much time left after Cinderella hour. This spread is only available in the Ballygunge and EM Bypass outlets.